McCartney Street will be the site of construction next semester, as Lafayette will start building its new mixed-use residence hall. It is planned to be four stories tall with 165 beds. The building should be open for use starting fall 2020, with upper-class student housing, a diner, the college bookstore and a patio. A hearing at the Northampton County Courthouse this morning sealed the deal for this timeline, with the lawsuit between four Easton residents and the city being dismissed. This development came just about a month after the college formally intervened in the suit. The four residents thought the process by which the city amended its zoning laws for the dorm to be built was illegal. Zoning laws needed to be changed to allow for the height and land coverage of the building. 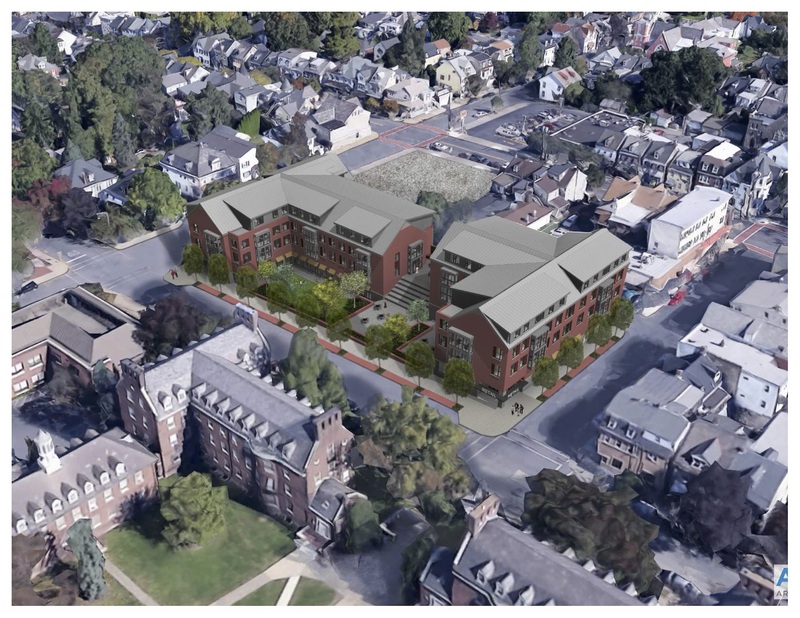 The Easton Planning Commission approved the preliminary plans for the residence hall about three weeks ago under these new zoning laws, and the college faced the risk of having its plans halted if the city lost this lawsuit. The college constructed and received three years’ approval for temporary modular housing on the March Field parking lot to accommodate the growth of the student body, and will be removing it once the new building is completed. About 30 more students than expected enrolled in the class of 2022: 759 total, compared to 681 the year prior, and 649 the year before that. Some rooms once doubles became triples this year to accommodate these students. The agreed upon terms which ended the suit included moving 517 Clinton Terrace, a home of historical significance to College Hill designed by William Michler in the early 1900s. The college is unsure as of now when the home will be moved, but it will go “to an appropriate location, relatively proximate, possibly on McCartney Street,” President Alison Byerly said. It is an “expensive” process to uproot it from its foundation and place it somewhere else. An outside company will be hired for the move, she added. The 517 Clinton Terrace home is part of the site which is planned to be demolished in phase two of the expansion, which is planned to occur in three to five years. The home may be moved as early as 2020, according to Vice President of Finance and Administration Roger Demareski. Additionally, the college is forming a committee to “strengthen the work of the Easton community” in early 2019. “We plan to convene a city-wide committee of Easton community partners that would include College leaders and College trustees, along with city, business, and nonprofit leaders, and other civic representatives,” Byerly wrote. Byerly also announced in her email that a scholarship to the college will be awarded yearly to an Easton Area High School student. The Morning Call reported that this is part of the settlement deal, as well. Save College Hill’s Facebook page urges Lafayette to “keep it in your campus,” opposing the college’s construction in the neighborhood. Correction 11/28/2018: This article originally stated that 517 Clinton Terrace was not planned to be demolished. It was formerly planned to be demolished under phase two of the college’s three-phase expansion.